Agreement also confirms the acquisition of 20 747-8 Freighters to grow and upgrade fleet. The agreement further strengthens the long and successful cooperation between the two companies. In addition, Boeing and Volga-Dnepr Group announced today at Farnborough International Airshow 2016 that they have finalized terms for the acquisition of 20 747-8 Freighters, which includes 4 aircraft that have already been delivered. Volga-Dnepr Group was the first to order the Boeing 747-8 Freighter in Russia and took delivery of its first 747-8 Freighter in 2012. The newly-ordered aircraft will support Volga-Dnepr’s long-term strategy to grow AirBridgeCargo’s fleet and replace current 747-400s. They will be acquired through a mix of direct purchases and leasing over the next six years. The newly-delivered 747-8 Freighter on display in the Cargo Village at Farnborough will be operated by CargoLogicAir, the new British cargo airline, which is a partner of Volga-Dnepr Group. Volga-Dnepr Group is the world leader in the unique, oversize and heavy cargo market and has represented the Russian airfreight industry in the international market since 1990. The Group, which includes three leading Russian all-cargo carriers – Volga-Dnepr Airlines, AirBridgeCargo Airlines and Atran Airlines – has a multinational team based in 15 countries. Volga-Dnepr is currently operating 12 Antonov 124-100, 5 IL-76TD-90VD, 15 Boeing 747s (seven Boeing 747-400F and eight Boeing 747-8F freighters) and three Boeing 737-400F. It is one of the leading carriers of aerospace cargoes, working with leading aircraft manufacturers and operators, helicopter manufacturers and operators, satellite companies, and aircraft parts manufacturers. The Group generates over 30% of its revenues from the delivery of aerospace cargoes and to date has completed over 5,150 flights for aerospace customers and carried nearly 170,000 tonnes of products. 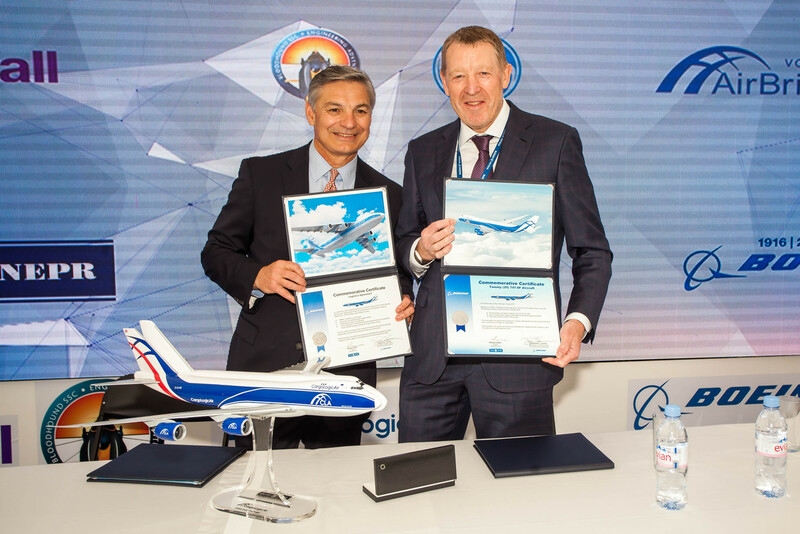 Image: Boeing’s Ray Conner (left) and Alexey Isaikin of Volga-Dnepr Group with the commemorative certificates signed today at Farnborough International Airshow to mark contracts covering long-term logistics support and the Group’s order for 20 747-8 Freighters.